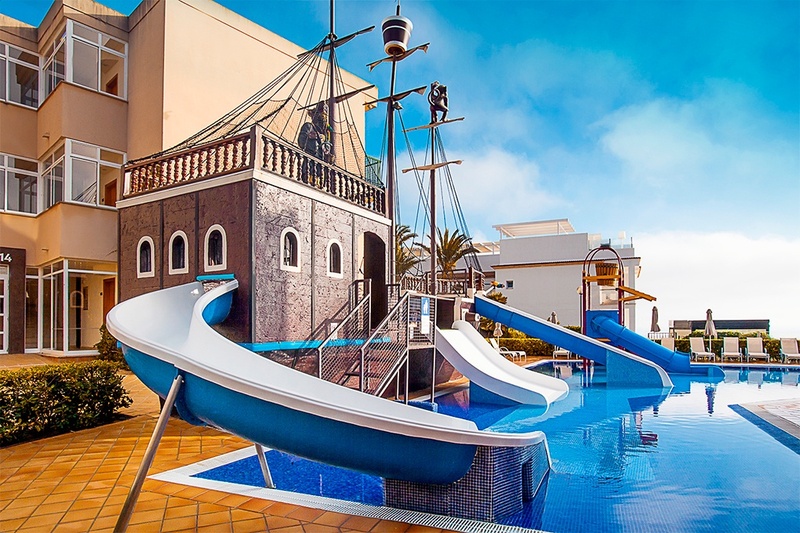 Hotels with waterslides make a genuine paradise for kids. 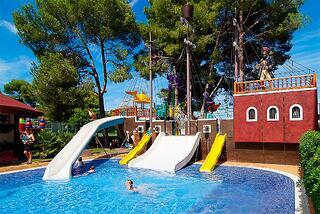 Make sure you choose the best hotel to enable your kids to have an unbeatable holiday. Sliding, fun and laughter are guaranteed… don’t miss out! VIVA Cala Mesquida Resort & Spa could be a destination in itself. At this exclusive hotel you’ll experience the VIVA Mood, a synonym for having a good time. It’s a large and unique destination that has a great variety of hotels and bars, a water park, the Balneum Spa, sports facilities and even Bufo’s mini-club, named after the pirate mascot of Hotels VIVA… Kids will voyage in their imaginations to magnificent destinations… not to mention an endless variety of activities that will keep them entertained! The rooms are large and luxurious, with first-rate comforts and spacious balconies offering spectacular views. But it’s not only the kids who’ll be kept busy: for the grown-ups too there are activities such as walking trails, a gym, a shooting range, shows…and everything you’ve always wanted from a hotel…Just a few minutes away you have the stunning Cala Mesquida with its turquoise waters and fine sand surrounded by plant life – it will take your breath away. VIVA Blue & Spa is an aparthotel located opposite Muro beach and next to the S´Albufera Natural Park. It boasts premium facilities with a stunning water park, an infinity pool and various options for eating without setting foot outside the hotel. Its location just next to the protected natural park makes VIVA Blue & Spa an ideal place to spend a relaxing family holiday, and offers you the chance of going for long bicycle rides while soaking up the marvellous Mallorcan landscape and feeling the gentle sea breeze in your face. The accommodation offers a mixture of comfort, luxury and nature. There are more than 265 rooms enabling you to savour the best views of Muro beach; you can even choose rooms with a private garden, terrace and sun loungers… An unalloyed delight, don’t you think? Endless activities to prevent kids and grown-ups from getting bored… Hotels with waterslides ensure that kids never want to get out of the water, and while they’re entertaining themselves you can take the chance to enjoy a massage in the spa or step into the jacuzzi and switch off from the world. VIVA Sunrise hotel is designed with both parents and their offspring in mind. The rooms are spacious and comfortable and many of them are equipped with private terraces and jacuzzis in the room. The hotel also boasts its own gym, so you don’t get out of shape, as well as a supermarket. There are various on-site bars and restaurants, a luxury spa and a children’s mini-club. Close at hand you have the Puerto de Alcudia, a charming area offering a host of leisure activities, restaurants and open-air pursuits. An authentic treat awaits! VIVA Eden Lago is a family-oriented hotel located next to Esperanza Lake and only 300 metres from the Bay of Alcudia. The rooms are studios and apartments featuring private balconies with chairs, and although they vary slightly in terms of décor, they are all stylishly decorated and have everything you need for a perfect holiday. The complex boasts an ample swimming pool, games for children, a tennis court, various bars and restaurants, venues for staging events… It’s hardly necessary to leave the hotel – you have everything you need right here! There are also a host of activities for grown-ups and kids…A mini-golf course, excursions around the island… You’ll have a whale of a time! Fun at these hotels both in and out of the water is guaranteed for all the family. Have you chosen yours?